An interesting and perhaps underused native ground cover plant the prostrate form of Casuarina glauca (see picture right) is an excellent alternative to many non native plants. Commonly called the ‘Cousin It’ plant, this a great plant for tough conditions. With cascading green foliage, and a very low growing growth habit , this is a ground hugging plant. It grows well in full sun, and as long as it is in a well drained environment it seems happy. Reaching to .6m when it ‘mounds’ but usually lower, it will trail gracefully over low walls. Individual plants will spread to 3m+ in time. Also known as ‘Shagpile’ and ‘Kattang Karpet’. This is a very useful plant for growing as cover for stumps and rocks, as it will mound over them and cover them up. 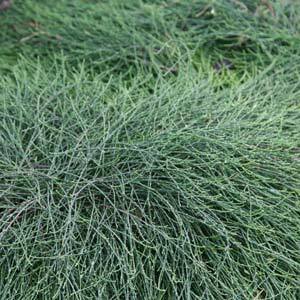 As Casuarina glauca has a longish tap root it is a plant that is difficult to transplant once established and being slow growing you will need to find it a ‘permanent home’. 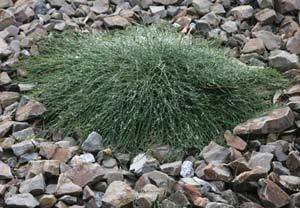 Suited to coastal plantings as well as being useful in rock gardens and as a general ground cover, Casuarina glauca prostrate requires little care once established. New plantings will require some water, and mulch to retain a little moisture and suppress weed growth is advisable. As a feature ground cover plant. For planting in difficult areas where it will provide an evergreen plant that will suppress weeds. For planting on slopes where it can help control erosion. Grow it in a container as a fascinating plant when allowed to trail over the edges. Height – Usually around 10 – 20 cms, however it is a plant that can form a slightly higher mound over time. Spread – To around 2 metres over time. Planting distance – For a dense ground cover, plant at around .5m to .75m apart. Fertiliser – Use a low phosphate native plant fertiliser. Water before and after fertilising. Very little maintenance is required other than the removal of any damaged foliage. Judicial pruning can be carried out to maintain size and shape if required. Fertilise with a low phosphate fertiliser, most specialist Australian Native plant fertilisers are suitable for Casuarina glauca prostrate.